Bar Crusher at Docklands this summer! Bar Crusher’s 620C will make its Docklands Summer Boat Show debut at the 2008 Melbourne International Boat & Lifestyle Show in February. The ultimate all-round coastal and offshore sportsfishing boat, the new 620C slots into the company’s impressive range between the hugely popular 560C and 640C. Constructed from heavy duty, pre-stressed 5mm (bottom sides) and 4mm (top sides) marine grade plate aluminium, this super-tough trailerable rig follows in the footsteps of every Bar Crusher to deliver the smoothest ride of any aluminium boat on the market. Measuring 6.80m LOA (waterline length 6.20m) with a 2.35m beam, the new cuddy cabin model features Bar Crusher’s unique Waveslicer non-pounding, deep-V hull, which slices through chop and performs brilliantly in a following sea, and the expertly-engineered Rigideck sub-floor system for maximum hull strength in all conditions. Of course, it wouldn’t be a Bar Crusher without the exclusive Quickflow water ballast technology. A cavity that runs the full length of the keel quickly fills with water when the boat is stationary, which lowers the chines into the water for greater stability, and drains in seconds as the boat moves forward to allow it to leap effortlessly onto the plane. 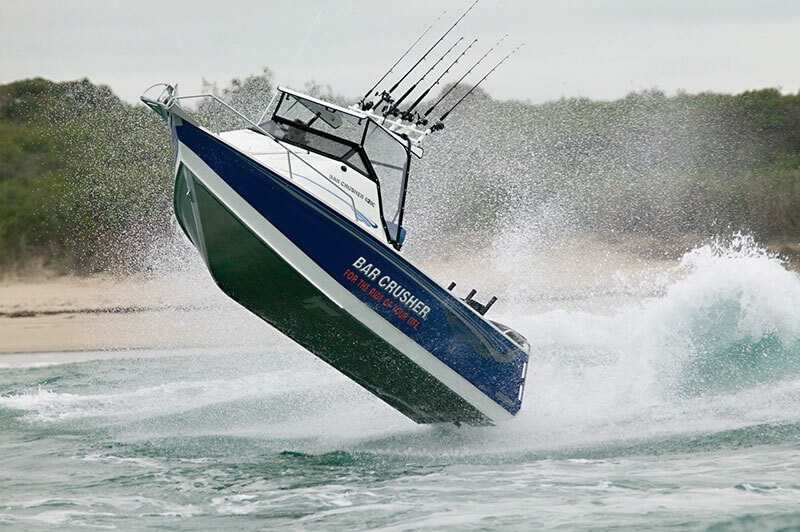 Rated to carry a 175hp outboard, the 620C’s superior performance capabilities, 200lt fuel capacity, huge cockpit fishing area, heavy-duty checkerplate deck, optional anchor winch, forward bunks and innovative gas-strut roof / foldable windscreen are just a few reasons why this new Bar Crusher will quickly earn a reputation as one of the most versatile trailerable sportsfishing boats in its class.